To preserve the health of our patients, visitors, and staff as well as protect the safety of our properties, Erlanger has joined numerous other companies—including other local health care facilities—in becoming a completely tobacco-free health system. The use of all tobacco products is prohibited on Erlanger campuses, physician offices, medical facilities, parking lots, garages, and inside vehicles parked on Erlanger properties. Tobacco products include, but are not limited to, cigarettes, cigars, chewing tobacco, snuff, pipes, and any device designed to transmit or convey tobacco smoke or related inhalant (e.g. electronic cigarettes). 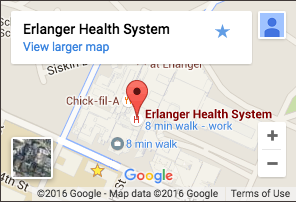 The care of patients remains Erlanger’s number one priority. That includes providing assistance to those who use tobacco products. For information on smoking cessation programs, contact the American Lung Association at 800-548-8252 or www.ffsonline.org, visit the American Cancer Society at www.cancer.org, call the Tennessee Tobacco QuitLine for a free quit coach at 1-800-Quit-Now (784-8669) or http://health.state.tn.us/tobaccoquitline.shtml, or ask your physician how you can participate in a tobacco-free lifestyle.